Podcasts. Make your podcasts here. Stupid Old Studios has its own dedicated podcast studio located upstairs from our main studio. Each week, some of the best Australian comedy podcasts are recorded right here - including Aunty Donna, Do Go On, Don’t You Know Who I Am, Fit Bet, Confessions of the Idiots and Two in the Think Tank. As well as offering basic studio hire, did you know we can also help you to make your own podcast? Even if you’ve never sat in front of a mic before, and the idea of pushing buttons makes you nervous. We can help you get the skills you need to make a podcast, for yourself, or for your business. Scroll past our booking form to find out more. Thank you for enquiring about booking the Stupid Old Podcast Studio. We’ll be in touch within 1-2 business days to confirm your booking. Please note that your booking will not be confirmed until you hear from us. If you already know what you’re doing, you just need a place to do it in, then why not hire out our podcast studio? Once you’re done you can take away your audio on USB, hard drive, or upload it to your favourite cloud service. At your first booking, someone from the studio will join you to show you the ropes, then we’ll leave it up to you to do your thing. RATES: $50 p/h between 8am and 6pm and $75 p/h between 6pm and 8am and all day on weekends. If you really want to start a podcast, but have no idea about the tech side of things, never fear. Options for uploading your podcast so that you can get it out into the world. If you have no/limited technical knowledge and/or would rather have an expert help you to help out when you come into our studio, we can help with that too. We can match you with one of the great producers in our network who can take care of all the technical stuff while you’re recording, and can edit and upload the podcast for you afterwards. From the Disneyland to the Rumble in the Jungle, the Chernobyl nuclear disaster to America's first serial killer, every week they cover a different topic suggested by the listeners. Al and Andy try and come up with five sketch ideas. Maybe seven if they don't think that the first five were very good. An unwelcome insight into the creative process with two of Australia's most in demand comedy writers and performers. Don’t You Know Who I Am? 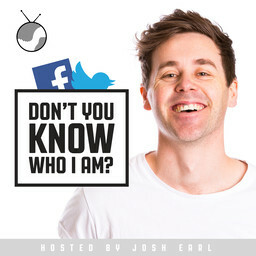 is a podcast where 4 guests from some of the biggest names in Australian comedy battle it out to find who knows whom, who knows what because, well… who knows why. Guests include comedy greats Celia Pacquola, Luke McGregor, Dave Thornton and Jon Safran to name a few! This podcast is part of the Nearly Podcast Network: www.nearly.com.au .